[From Totnes News] MEMBERS of the Atmos Project in Totnes go into a meeting with Dairy Crest officials secure in the knowledge that they have the backing of the town for their vision of the future of the now derelict site. Around 300 people gave a ringing endorsement to the plans for bringing the Station Road site, once occupied – and still owned – by the milk giant, into community ownership. Atmos has ambitious plans to transform the site into a mixed-use development, with affordable housing, new businesses and open spaces for public events. ‘Let’s do it then,’ said Rob, who will be amongst those meeting Dairy Crest officials on May 4 to discuss what happens to the site. Town mayor Cllr Judy Westacott said she had attended an early meeting with former MP Anthony Steen. ‘Since then the group has been trying and trying to engage Dairy Crest, to look at what is obviously one of the best proposals to come out of Totnes for many years, and Dairy Crest have done nothing. 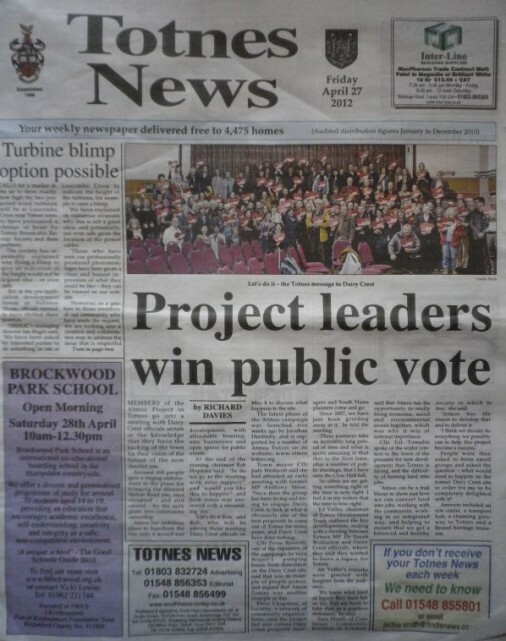 Cllr Pruw Boswell, one of the organisers of the campaign to save Brunel’s pumping house from demolition on the Dairy Crest site, said that was an example of people power, and argued that Atmos Totnes was another example of this. Dave Chapman, of Locality, said the project had seen various Dairy Crest property managers and South Hams planners come and go. Ed Vidler, chairman of Totnes Development Trust, outlined the key developments, ending with a meeting between Totnes MP Dr Sarah Wollaston and Dairy Crest officials, where they said they wanted to leave a legacy for Totnes. Mr Vidler’s remarks were greeted with laughter from the audience. ‘We know what kind of legacy they have left so far, but we have to take that as a positive statement,’ he said. Sara Neuff of Coin Street Community Builders in London. said that Atmos has the opportunity to really bring economic, social and environmental issues together, which was why it was of national importance. Cllr Jill Tomalin spoke of the wider context in the town of the pressure for new development that Totnes is facing, and the difficulty of turning land into jobs. ‘Atmos can be a trail blazer to show just how we can convert land into jobs, working with the community, working in an integrated way, and helping to ensure that we get a balanced and healthy society in which to live,’ she said. ‘Atmos has the vision to develop that and to deliver it. I think we should do everything we possibly can to help this project become a success.’ People were then asked to form small groups and asked the question – what would need to happen on the former Dairy Crest site in order for me to be completely delighted with it? Answers included an arts centre, a transport hub, a stunning gateway to Totnes and a Brunel heritage museum.